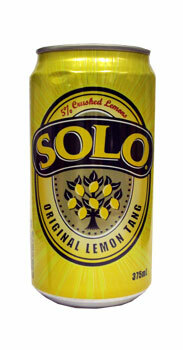 Solo is great for quenching a built up thirst, its light fizz allows you to slam its refreshing lemon tang quickly. Carbonated Water, Sugar, Reconstituted Lemon Juice (5%), Food Acids (E330, E331), Natural Flavour, Preservative (E211), Natural Colour (Safflower Extract). When I discovered I could get my favourite Aussie soft drink here in the UK, I was over the moon. Serve chilled, it is the most refreshing, tangy lemon drink you can get. I highly recommend this drink, it is perfect.